These results suggest that MERS-CoV can infect dromedary camels and can be transmitted from them to humans by close contact. According to Ziad Memish, Saudi Arabia's Deputy, professor in the College of Medicine at Al Fasial University in Riyadh (See Reference: www.thelancet.com Volume 383/May 24/2014), "more than two-thirds of the primary human cases have no links to camels." He suggested the possibility of another species in acting as an intermediary. After a bat of the Taphozous genus was found in a fragments of the MERS sequence,  bats have been accused as a possible source of transmission. But contacts between bats and people are rare, and this idea still needs more study and is considered a hypothesis. For epidemiologic purposes, the following MERS-CoV infection case definitions have been proposed by the WHO:  Confirmed case by laboratory confirmation or Probable case by symptoms and signs. The MERS-CoV outbreak in Jeddah and the importance of the knowledge of etiology and protection from MERS-CoV led us to conduct this study on dental students, with an aim to evaluate their knowledge and awareness of MERS-CoV. As with other coronaviruses, no antiviral agents are recommended for the treatment of MERS-CoV infection. In a retrospective cohort study in patients with severe MERS-CoV infection, combination therapy with ribavirin and interferon alfa-2a, started a median of 3 days after diagnosis (20 patients), was associated with significantly improved survival at 14 days, compared with 24 patients who received only supportive care (70 vs 29% survival), but the outcome was not significant at 28 days (30 vs 17% survival, a nonsignificant difference). ,, It is difficult to interpret the results of this retrospective study, and further evaluation by conducting randomized trials is needed before treatment recommendations can be made. The WHO and the CDC have issued recommendations for the prevention and control of MERS-CoV infections in healthcare settings. ,, An increased level of infection control precautions is recommended when caring for patients with probable or confirmed MERS-CoV infection, compared to that used for patients with community-acquired coronaviruses or other community-acquired respiratory viruses. The WHO recommends that individuals at high risk of severe disease, such as immunocompromised hosts and those with diabetes, chronic lung disease, or pre-existing renal failure, should take precautions when visiting farms, barn areas, camel pens, or market environments where camels are present. These measures include avoiding contact with camels, practicing good hand hygiene, avoiding drinking raw camel milk or camel urine, avoiding eating meat that has not been cooked thoroughly, and avoiding eating food that may be contaminated with animal secretions or products unless they are properly washed, peeled, or cooked. Study participants were recruited from among the dental students of Al-Farabi College, Jeddah (high level 9 + 10 - male and female) who are in direct contact with the patients and this was considered as the main criterion of selection. 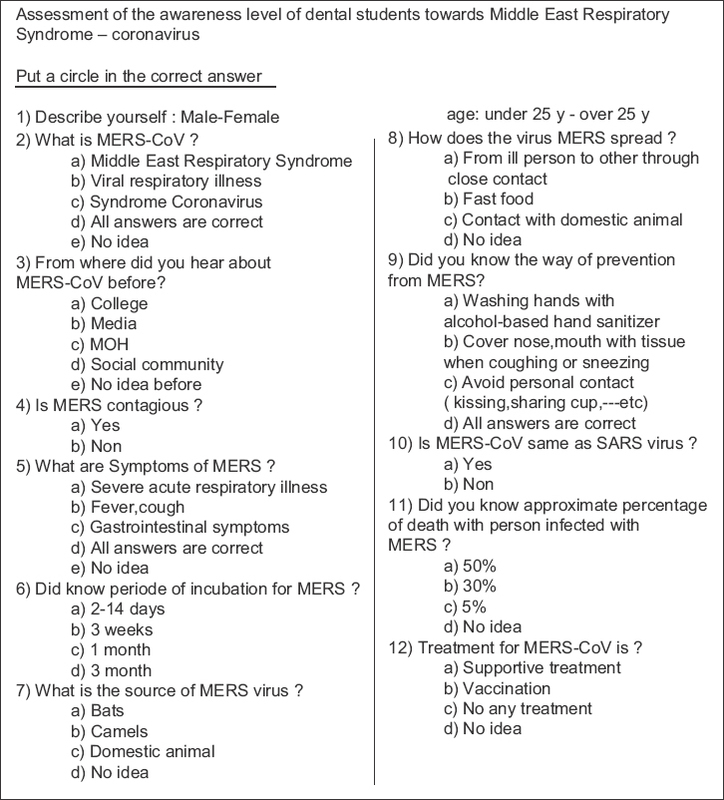 The questionnaire contained 12 questions which were formulated based on the information given by MOH for MERS-CoV. The questionnaire was edited in English and distributed to the dental group (see the questionnaire in Appendix 1 [Additional file 1] ). The questionnaire was divided into multiple sections to assess definition, symptoms, source of infection, infection control, protection, and treatment. The questionnaire included specific questions exploring the knowledge, such as rate of mortality, period of incubation, and way of spreading; a single-item scale was used to record the respondents' replies. There were 200 respondents in the study. The respondents comprised 81 (40%) male and 119 (60%) female. More than 73% (145) of respondents were under 25 years and 27% (55) were over 25 years of age. About 44% of respondents knew the definition of MERS as Middle East Respiratory Syndrome and 27% knew other definitions, while 18% of respondents had no idea. Furthermore, 27% of respondents had gained their knowledge about MERS from college and 25% from MOH, while 17% of respondents had no idea. 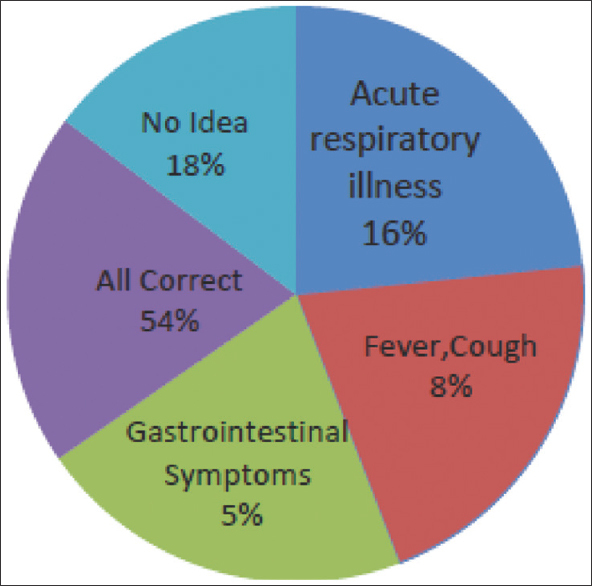 The majority of respondents (75%) considered that MERS is contagious and 54% knew related symptoms such as severe acute respiratory illness, fever, cough, and gastrointestinal symptoms [Figure 1]. One-third of the respondents 27% were aware that the period of incubation for MERS is about 2-14 days. 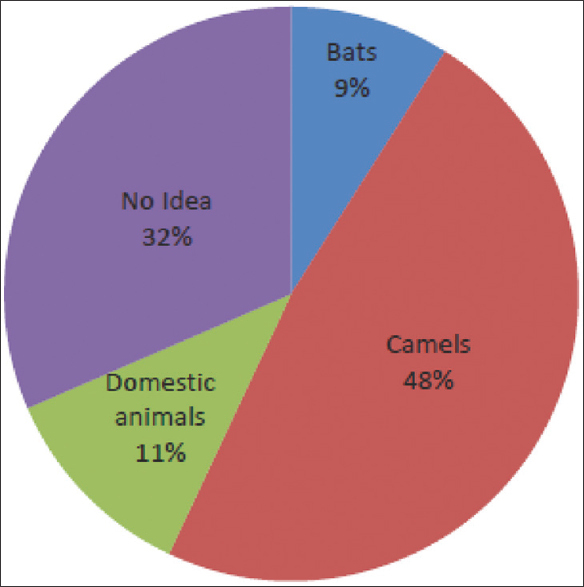 A sizable proportion (48%) of the respondents reported that the source of MERS-CoV is camels, 18% gave the answer as bats, and 32% had no idea [Figure 2]. 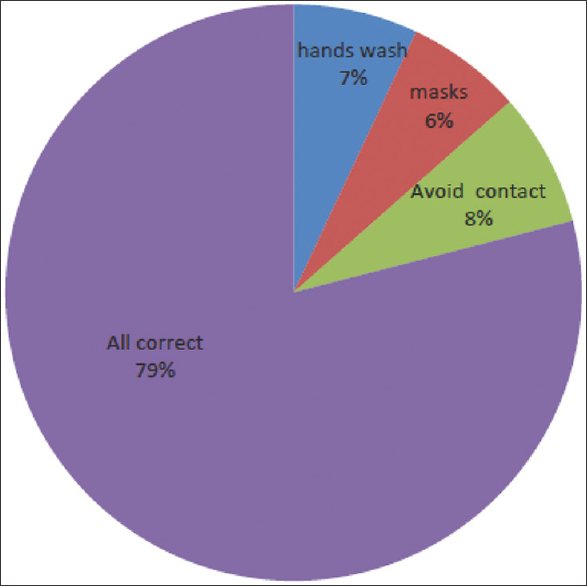 More than two-thirds (64%) of the respondents knew that close contact with confirmed MERS patient spreads the infection and 79% applied methods of protection such as washing hands with alcohol sanitizer, using mask, goggles, and avoiding personnel contact with the confirmed patient [Figure 3]. Also, 52% of respondents could distinguish between SARS and MERS. One-third of the respondents reported that the percentage of death in MERS is about 30% and 77% knew that there is no vaccination for MERS. Also, two-thirds of the respondents (60%) considered that the treatment is supportive based on clinical condition of the patient. The respondents in this study had higher education level (level 9-10 dental school) according to their level in dental school and were mainly female (60%), which indicates that females are more concerned with medical outbreak of the disease than males. About 44% of respondents knew the definition of MERS and that MERS-CoV is an airborne pathogen, 54% recognized the symptoms, and 48% realized that the probable source of MERS virus is camels, while 64% were aware about the way of spreading by close contact and 79% had knowledge of instructions and measures for protection. However, this finding at least reveals respondents' awareness of mode of transmission and the importance of following the instructions for protection. Aerosol is now considered the major route of MERS transmission. Respondents identified that close contact with a patient of MERS-CoV is one of the main routes of spreading the virus (64%). Also, a high proportion (79%) of respondents was aware about the instructions of protection. So, this indicates that the information related to the way of contamination and spreading of MERS-CoV and the measures for protection is well known. First droplet precaution is wearing a surgical mask within 1 m of the patient; contact precaution is also important by wearing gown and gloves on entering the room and removing them on leaving. Eye protection should be added when caring for probable or confirmed cases of MERS-CoV infection. However, the majority of respondents (79%) were aware of the measures adopted for protection and 75% knew that MERS-CoV is contagious, and therefore, it is very important to apply the methods of protection. From the results of this survey, it is very encouraging to conclude that our dental students had good knowledge of MERS-CoV (etiology, symptoms, protection) and this may reflect the successful distribution of the information about MERS-CoV by college 27% and MOH 25%. More awareness of MERS-CoV hazards is required by medical staff who are the first people in contact with patients infected by the virus. Our data indicate the necessity for further continuing education among medical staff, as well as improving public education about infection control. The MERS-CoV outbreak in Jeddah and the increasing number of healthcare workers affected remind us of the need to acquire the basics information of infection control which is the main principle for protection from MERS-CoV. We emphasized on the necessity of providing more information about prevention of any susceptible viral infection to the healthcare workers. de Groot RJ, Baker SC, Baric RS, Brown CS, Drosten C, Enjuanes L, et al. Middle East respiratory syndrome coronavirus (MERS-CoV): Announcement of the Coronavirus Study Group. J Virol 2013;87:7790-2. Chan JF, Chan KH, Choi GK, To KK, Tse H, Cai JP, et al. Differential cell line susceptibility to the emerging novel human betacoronavirus 2c EMC/2012: Implications for disease pathogenesis and clinical manifestation. J Infect Dis 2013;207:1743-52. Müller MA, Raj VS, Muth D, Meyer B, Kallies S, Smits SL, et al. Human coronavirus EMC does not require the SARS-coronavirus receptor and maintains broad replicative capability in mammalian cell lines. MBio 2012;3. pii: e00515-12. Meyer B, García-Bocanegra I, Wernery U, Wernery R, Sieberg A, Müller MA, et al. Serologic assessment of possibility for MERS-CoV infection in equids. Emerg Infect Dis 2015;21:181-2. World Health Organization. Middle East Respiratory Syndrome Coronavirus (MERS-CoV): Summary of Current Situation, Literature Update and Risk Assessment-as of 5 th February 2015. Available from: http://www.who.int/csr/disease/coronavirus_infections/mers-5-february-2015.pdf?ua=1. [Last accessed on 2015 Mar 04]. World Health Organization. Global Alert and Response. Middle East respiratory Syndrome Coronavirus (MERS-CoV)-Saudi Arabia. Available from: http://www.who.int/csr/don/16-april -2015-mers-saudi-arabia/en/. [Last accessed on 2015 Apr 17]. WHO. Global Alert and Response. Middle East Respiratory Syndrome Coroonavirus (MERS-CoV)-15 th May 2014. Available from: http://www.who.int/csr/don/2014_05_15_mers/en/. [Last accessed on 2014 May 19]. Annan A, Baldwin HJ, Corman VM, Klose SM, Owusu M, Nkrumah EE, et al. Human betacoronavirus 2c EMC/2012-related viruses in bats, Ghana and Europe. Emerg Infect Dis 2013;19:456-9. Ithete NL, Stoffberg S, Corman VM, Cottontail VM, Richards LR, Schoeman MC, et al. Close relative of human Middle East respiratory syndrome coronavirus in bat, South Africa. Emerg Infect Dis 2013;19:1697-9. Memish ZA, Mishra N, Olival KJ, Fagbo SF, Kapoor V, Epstein JH, et al. Middle East respiratory syndrome coronavirus in bats, Saudi Arabia. Emerg Infect Dis 2013;19:1819-23. The Lancet Infectious Diseases. Need for global cooperation in control of MERS-CoV. Lancet Infect Dis 2013;13:639. Azhar EI, El-Kafrawy SA, Farraj SA, Hassan AM, Al-Saeed MS, Hashem AM, et al. Evidence for camel-to-human transmission of MERS coronavirus. N Engl J Med 2014;370:2499-505.
WHO. MERS-CoV Enigma Deepens as Reported Cases Surge. Vol. 383. Available from: http://www.thelancet.com. [Last accessed on 2014 May 24]. WHO. Infection Control and MERS-CoV in Health-Care Workers. Vol. 383. Available from: http://www.thelancet.com. [Last accessed on 2014 May 31]. World Health Organization. Middle East respiratory Syndrome Coronavirus (MERS-CoV) Summary and Literature Update - As of 20 th Jan 2014. Available from: http://www.who.int/csr/disease/coronavirus_infections/MERS_CoV_Update_20_Jan_2014.pdf. [Last accessed on 2014 Jan 29]. Oboho IK, Tomczyk SM, Al-Asmari AM, Banjar AA, Al-Mugti H, Aloraini MS, et al. 2014 MERS-CoV outbreak in Jeddah-a link to health care facilities. N Engl J Med 2015;372:846-54. World Health Organization. WHO Statement on the 8 th Meeting of the IHR Emergency Committee Regarding MERS-CoV. Available from: http://www.who.int/mediacentre/news/statements/2015/8 th -mers-emergency-committee/en/. [Last accessed on 2015 Mar 10]. World Health Organization. Revised Case Definition for Reporting to WHO-Middle East Respiratory Syndrome Coronavirus-Interim Case Definition as of 14 th July 2014. Available from: http://www.who.int/csr/disease/coronavirus_infections/case_definition/en/. [Last accessed on 2015 Mar 06]. Assiri A, McGeer A, Perl TM, Price CS, Al Rabeeah AA, Cummings DA, et al. ; KSA MERS-CoV Investigation Team. Hospital outbreak of Middle East respiratory syndrome coronavirus. N Engl J Med 2013;369:407-16. Drosten C, Seilmaier M, Corman VM, Hartmann W, Scheible G, Sack S, et al. Clinical features and virological analysis of a case of Middle East respiratory syndrome coronavirus infection. Lancet Infect Dis 2013;13:745-51. Memish ZA, Zumla AI, Al-Hakeem RF, Al-Rabeeah AA, Stephens GM. Family cluster of Middle East respiratory syndrome coronavirus infections. N Engl J Med 2013;368:2487-94. World Health Organization. Global Alert and Response. Novel Coronavirus Summary and Literature Update-As of 17 th May 2013. Available from: http://www.who.int/csr/disease/coronavirus_infections/update_20130517/en/index.html#. [Last accessed on 2013 May 17]. Guery B, Poissy J, el Mansouf L, Séjourné C, Ettahar N, Lemaire X, et al. Clinical features and viral diagnosis of two cases of infection with Middle East Respiratory Syndrome coronavirus: A report of nosocomial transmission. Lancet 2013;381:2265-72. Assiri A, Al-Tawfiq JA, Al-Rabeeah AA, Al-Rabiah FA, Al-Hajjar S, Al-Barrak A, et al. Epidemiological, demographic, and clinical characteristics of 47 cases of Middle East respiratory syndrome coronavirus disease from Saudi Arabia: A descriptive study. Lancet Infect Dis 2013;13:752-61. Centers for Disease Control and Prevention (CDC). Updated information on the epidemiology of Middle East respiratory syndrome coronavirus (MERS-CoV) infection and guidance for the public, clinicians, and public health authorities, 2012-2013. MMWR Morb Mortal Wkly Rep 2013;62:793-6. Breban R, Riou J, Fontanet A. Interhuman transmissibility of Middle East Respiratory Syndrome coronavirus: Estimation of pandemic risk. Lancet 2013;382:694-9. Tran K, Cimon K, Severn M, Pessoa-Silva CL, Conly J. Aerosol generating procedures and risk of transmission of acute respiratory infections to healthcare workers: A systemic review. PloS One 2012;7:e35797. Hui DS, Memish ZA, Zumla A. Severe acute respiratory syndrome vs. the Middle East Respiratory Syndrome. Curr Opin Pulm Med 2014;20:233-41. Seto WH. Conly JM, Pessoa-Silva CL, Malik M, Eremin S. Infection prevention and control measures for acute respiratory infection in healthcare setting: An update. East Mediterr Health J 2013;19(Suppl 1):539-47. World Health Organization. Interim Guidance Document. Clinical Management of Severe Acute Respiratory Infections when Novel Coronavirus is Suspected: What to do and What Not to do. Available from: http://www.who.int/csr/disease/coronavirus_infections/InterimGuidance-ClinicalManagement_NovelCoronavirus_11Feb13.pdf. [Last accessed on 2013 Apr 09]. Falzarano D, de Wit E, Martellaro C, Callison J, Munster VJ, Feldmann H. Inhibition of novel β coronavirus replication by a combination of interferon-α2b and ribavirin. Sci Rep 2013;3:1686. Falzarano D, de Wit E, Rasmussen AL, Feldmann F, Okumura A, Scott DP, et al. Treatment with interferon-α2b and ribavirin improves outcome in MERS-CoV-infected rhesus macaques. Nat Med 2013;19:1313-7. Omrani AS, Saad MM, Baig K, Bahloul A, Abdul-Matin M, Alaidaroos AY, et al. Ribavirin and interferon alfa-2a for severe Middle East respiratory syndrome coronavirus infection: A retrospective cohort study. Lancet Infect Dis 2014;14:1090-5. World Health Organization. Middle East Respiratory Syndrome Coronavirus (MERS-CoV) Summary and Literature Update-As of 9 th May 2014. Available from: http://www.who.int/csr/disease/coronavirus_infections/MERS_CoV_Update_09_May_2014.pdf?ua=1. [Last accessed on 2014 May 12]. Centers for Disease Control and Prevention. Interim Infection Prevention and Control Recommendations for Hospitalized Patients with Middle East Respiratory Syndrome Coronavirus (MERS-CoV). Available from: http://www.cdc.gov/coronavirus/mers/downloads/mers-infection-control-guidance-051414.pdf. [Last accessed on 2015 Apr 06]. Harriman K, Brosseau L, Trivedi K. Hospital-associated Middle East respiratory syndrome coronavirus infections. N Engl J Med 2013;369:1761. Bialek SR, Allen D, Alvarado-Ramy F, Arthur R, Balajee A, Bell D, et al. Centers for Disease Control and Prevention (CDC). First confirmed cases of Middle East respiratory syndrome coronavirus (MERS-CoV) infection in the United States, updated information on the epidemiology of MERS-CoV infection, and guidance for the public, clinicians, and public health authorities-May 2014. MMWR Morb Mortal Wkly Rep 2014;63:431-6. World Health Organization. Middle East Respiratory Syndrome Coronavirus (MERS-CoV)-13 th June 2014. Update on MERS-CoV Transmission from Animals to Humans, and Interim Recommendations for at-risk Groups. Available from: http://www.who.int/csr/disease/coronavirus_infections/MERS_CoV_RA_20140613.pdf?ua=1. [Last accessed on 2014 Jun 17]. Seto WH, Tsang D, Yung RW, Ching TY, Ng TK, Ho M, et al. Effectiveness of precaution against droplets and contact in prevention of nosocomial transmission of severe acute respiratory syndrome (SARS). Lancet 2003;361:1519-20. CDC. Interim Infection Prevention and Control Recommendation for Hospitalized Patient with Middle East Respiratory Syndrome Coronavirus. Available from: http://cdc.gov/coronavirus/mers/infection-prevention-control. [Last accessed on 2014 May 15]. 6 Are Saudi medical students aware of middle east respiratory syndrome coronavirus during an outbreak?